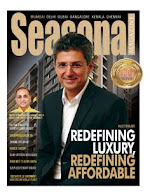 Seasonal Magazine: OBEROI REALTY IPO - Will Oberoi’s Daring Prove Risky for Investors? OBEROI REALTY IPO - Will Oberoi’s Daring Prove Risky for Investors? Even bigger players like EmaarMGF & Lodha are waiting on the sidelines unwilling to take the IPO plunge, learning from the recent lessons of Nitesh & Jaypee. But Oberoi Realty has identified that the market sentiment is better, which even while being true for the main indices, doesn’t apply to the realty index at all, which continues to be risky, having lost another 10% since the beginning of this year. Despite being a developer based in Mumbai known for its high profitability for developers, many of Oberoi’s properties are charged at only around Rs. 11,000 per sq ft, due to being in suburbs like Goregaon. However, Oberoi is banking on some differentiating strengths like its low debt levels and low land holdings, which has resulted in an above-average IPO rating. But according to some recent unconfirmed reports the Group’s pre-IPO valuation has suffered since the original IPO announcement, having reportedly halved from Rs. 14,000 crore to Rs. 7000 crore. A query sent to Vikas Oberoi to ascertain this did not elicit a response. This may affect the book value of the share as well as force the promoters to part with a bigger stake to collect the Rs. 1000 to Rs. 1500 crore eyed. But all eyes will be on the offer’s price-to-earnings ratio. If Oberoi is willing to offer at a reasonable P/E between 15 to 20, there is a good chance of investors warming up to it. But P/E multiples in the 20s and 30s would be a tough call for Oberoi. Clarification on this was not received from Oberoi Realty at the time of publishing.